Barrie and Orillia receive a significant amount of snow each winter. Snow shovelling should be taken seriously. It takes a lot of effort. Many are not properly prepared and injure themselves. 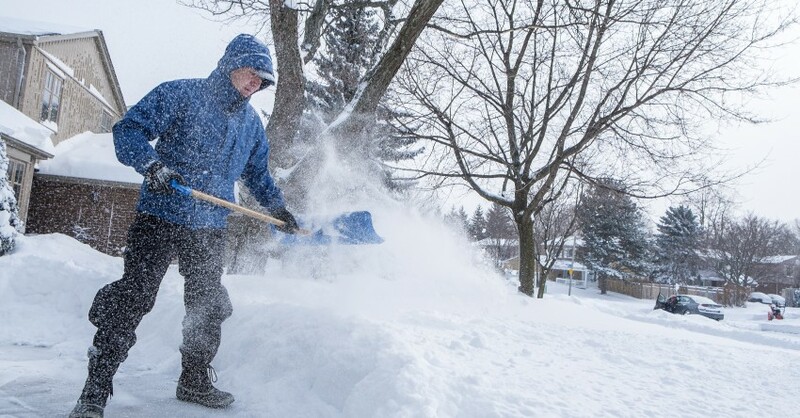 Follow these 5 tips to help avoid injuring yourself while clearing your driveway and walkway. Dress appropriately for the current weather. Always dress warm. If it’s windy or extremely cold, be sure to cover your face and hands. Wear boots with slip resistant soles. An ergonomic shovel with a curved handle is ideal as it keeps your back straight. Start with smaller amounts of snow. Especially if it’s early on in the season and you haven’t got much snow removal exercise yet this year. Don’t try to push too much snow or go to quickly. We know you want to get back into the house where it’s warm but it’s not worth injuring yourself. Also, by starting with smaller amounts of snow you allow your muscles to warm up. You can avoid muscle strains this way. Lifting snow takes much more energy than pushing it. You’ll spare your spine and you’ll have more energy to finish the entire driveway. Keep the shovel closer to your body, leaving space between your hands. This will allow you to use less force to push the snow. Push smaller amounts of sow, especially when it’s deep, to avoid muscle strain. You’ll inevitably have to lift Â snow. Make sure you do it right. Keep your legs apart, straighten your back and bend your knees. Do not bend from the waist. Be sure to lift small amounts of snow and walk slowly to where you want to throw it. Taking too much snow at one time can lead to back injuries and will cause to to tire quickly. Always throw the snow forward. Throwing it sideways or over your shoulder will most likely lead to injuries. You may be dealing with multiple layers of snow or even ice. Don’t assume that every layer is as light and fluffy as what may be on top. You could end up jamming your shovel into harder snow causing you to fall or injure your back. You may find ice below the top layer of snow as well. And when it just becomes too much, or you just don’t feel like it anymore, request a plow and we’ll shovel your driveway for you.